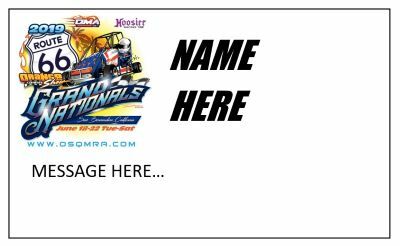 We are offering a 3x3 Driver Dedicated Banner with the Grands Logo, Driver Name & Picture (Please submit the photo that you would like to see on your banner.We will place the signs around the track during the Grands and you can take them home after the event. This is a great way to show your support for your drivers. Each sign is $50. Forms must be received by June 3 , 2019 to allow time for printing. PLEASE DOUBLE CHECK ALL SPELLING IN THE ABOVE SECTIONS FOR ACCURACY TO BE PRINTED ON THE DRIVER BANNER.